Powcher's Hall, Ely - Ely, Cambs. Walk back in the direction of the Porta and take the other path leading back again towards the Cathedral, passing the meadow (See Plan). Approach the south door but first turn to your right to face the cluster of monastic buildings there. 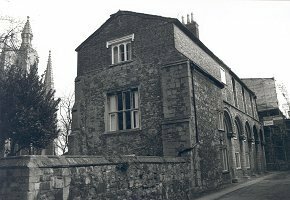 This group was formally the Monastic Infirmary (10) on the left is Powcher's Hall (11) once the blood-letting house of the monastery. Here the practice, thought to be healthy, of using leeches to bleed the monks several times a year took place.